The intensity of tortured love between the four Tyrones in Eugene O’Neill’s tenderly intimate and brutally heart-wrenching autobiographical tragedy Long Day’s Journey Into Night would be repulsive if it were not so humane, bizarrely and sometimes even comically self-aware, and so believably eloquent and poetic. It is a supreme challenge for actors and directors, and a modern masterpiece. 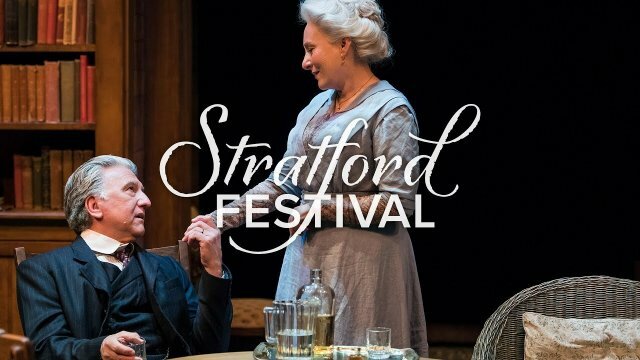 This revival perhaps lacks some of the grandeur of Stratford’s superb two earlier productions, and does some judicious trimming of the text, but it is reasonably faithful to O‘Neill, truly moving, and a welcome return of a classic. There is no pretense that the Tyrone family is not the O’Neill family or that their efforts to please one another overlook their underlying unhappiness. The surprising fact that Mrs. O’Neill did actually overcome her drug addiction and die sober is nowhere suggested in O’Neill’s autobiographical plays. Seana McKenna’s affecting Mary Tyrone offers few visible hints of her desperate deterioration, appearing to be a pretty, white-haired older woman with no obvious signs of losing control. Florence Eldridge’s haunting original 1956 performance achieved startling, sudden wraithlike moments. But McKenna’s terribly real-seeming naturalistic final scene is heartbreaking. Similarly, Scott Wentworth’s James Tyrone’s deeply felt speech about his lost creativity as a potentially great Shakespearean actor, and his painfully loving care yet competitive conflict with his wife and sons add up to a masterful performance. Charles Gallant plays Edmond, the younger son, with some hint of the playwright’s own character, but a modest understatement except in his big drunken scene with Wentworth. Gordon S. Miller’s Jamie is bold and touching in his drunken scene warning his younger brother not to trust him. And Amy Keating is (probably rightly) a sympathetic maidservant whose good humor seems to belong in another play. Décor is realistic as is Steve Lucas’s lighting, though almost too noticeably supportive of the mood of each scene. We know the intended set. It is the same as the one for O’Neill’s one comedy, Ah, Wilderness! – the interior of the Monte Cristo mansion on the O’Neill estate. Peter Hartwell’s version makes a few, small changes. O’Neill was a master of stage direction and did not include commentary for the reader but unheard by the audience, as Shaw did. I think his staging of the final scene is poetic and un-improvable. But it is seldom followed now. For one thing, Swinburne’s “a Leave-taking” recited bitterly by Jamie is now usually omitted. I miss it. And O’Neill’s directions have Mary walk toward James, Jamie, and, climactically Edmund, as the verses end “She would not know,” “She would not hear,” “She would not see.” Then, oblivious, Mary speaks her eerie final reverie. In their long confessional scene together, Tyrone reacts to Eugene O’Neill’s character, Edmund’s lyrical lament by saying that Edmund has “the makings of a poet”; and Edmund replies that he‘s “got only the habit.” For how long will how many of us recall with pleasure and awe these examples of that habit?